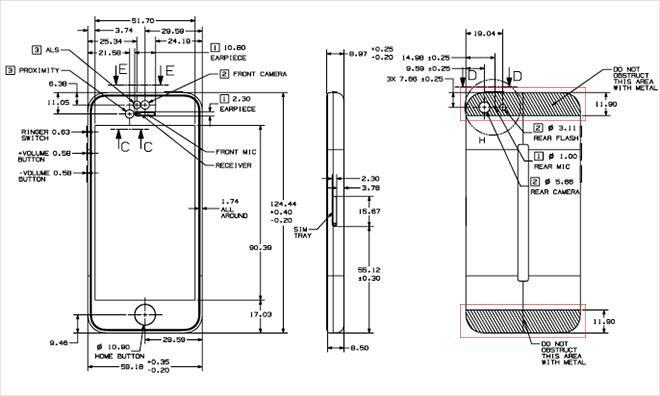 In a recent update to its reference guidelines for third party case manufacturers, Apple added highly detailed schematics for the forthcoming iPhone 5s and 5c, allowing for inferences to be made as to the devices' internal layouts. While Apple has already announced the most notable specifications for its two new smartphones, the revised guidelines (PDF link) published to Apple's Developer Center reveal a bit more about the construction of each handset. As pointed out by AppleInsider reader Jon, the drawings come with notations that help case makers design products which do not interfere with the devices' functions. This information offers at least some insight into how Apple laid out the iPhone 5s and 5c's internal components. For example, while the iPhone 5c is known to have a polycarbonate body with a steel-reinforced frame that doubles as a multi-band antenna, the drawings show the design requires radio transparent windows at the top and bottom of the chassis. This is a carry over from the CDMA version of the iPhone 4, which disposed two antennas in the phone's metal frame. The iPhone 5 refined the tech with integrated cellular antennas that dynamically and seamlessly selected which array to use based on signal strength. Also seen in the 5c's document is a slight curvature to the plastic casing's back, represented by a long rectangular mid section and lines extending out to the edge of the device. 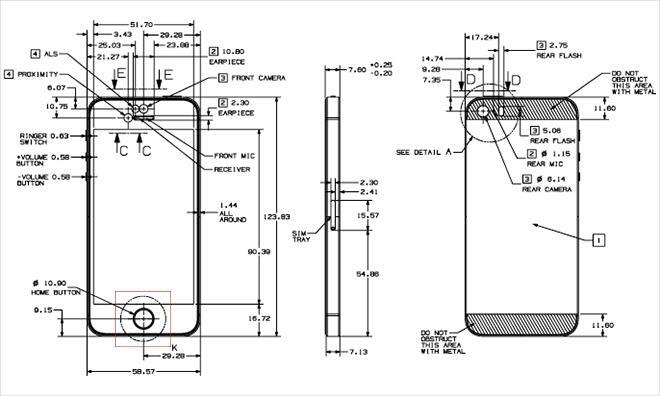 iPhone 5s schematic with Touch ID highlighted. Click for full schematic. With the iPhone 5s, the Touch ID fingerprint sensor embedded in the device's home button appears to be the biggest change case manufacturers have to compensate for compared to last year's model. As seen in the drawings, the "keepout" area surrounding the button is slightly larger than the iPhone 5c, likely due to the steel ring that encircles the physical input as part of Touch ID's capacitive sensor technology. As with the iPhone 5, the document notes that no metal should come in contact with the iPhone 5s' chassis. Doing so would cause unwanted attenuation with the integrated antennas, resulting in signal degradation. Aside from the extensive external dimensions, not much can be gleaned from the schematics. However, much more information regarding internal components like the new Touch ID home button and A7 SoC will be revealed when the iPhones undergo inevitable teardowns after Friday's launch.